Every year, thousands of conventional total shoulder replacements are successfully done in the United States for patients with shoulder arthritis. 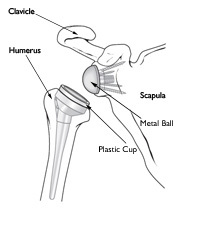 This type of surgery, however, is not as beneficial for patients with large rotator cuff tears who have developed a complex type of shoulder arthritis called “cuff tear arthropathy.” For these patients, conventional total shoulder replacement may result in pain and limited motion, and reverse total shoulder replacement may be an option. Your orthopedic surgeon will help you plan and prepare for your shoulder surgery. Most patients must have a complete physical by their primary care doctor before surgery. This is needed to make sure you are healthy enough to have the surgery and complete the recovery. Many patients with chronic medical conditions, like heart disease, must also be evaluated by a specialist, such a cardiologist, before the surgery. If you take blood thinners, either your primary care doctor or cardiologist will advise you about stopping these medications before surgery. Making simple changes in your home before surgery can make your recovery period easier. For the first several weeks after your surgery, it will be hard to reach high shelves and cupboards. Before your surgery, be sure to go through your home and place any items you may need afterwards on low shelves. When you come home from the hospital, you will need help for a few weeks with some daily tasks like dressing, bathing, cooking, and laundry. If you will not have any support at home immediately after surgery, you may need a short stay in a rehabilitation facility until you become more independent. Wear loose-fitting clothes and a button-front shirt when you go to the hospital for your surgery. After surgery, you will be wearing a sling and will have limited use of your arm. You will most likely be admitted to the hospital on the day of your surgery. After admission, you will be taken to the preoperative preparation area and will meet a doctor from the anesthesia department. You, your anesthesiologist, and your surgeon will discuss the type of anesthesia to be used. You may be provided a general anesthetic (you are asleep for the entire operation), a regional anesthetic (you may be awake but have no feeling around the surgical area), or a combination of both types. This procedure to replace your shoulder joint with an artificial device usually takes about 2 hours. Your surgeon will make an incision either on the front or the top of your shoulder. He or she will remove the damaged bone and then position the new components to restore function to your shoulder. Reverse total shoulder replacement is a highly technical procedure. Your surgeon will evaluate your particular situation carefully and discuss the risks of surgery with you. Risks for any surgery include bleeding and infection. Complications specific to a total joint replacement include wear, loosening, or dislocation of the components. If any of these occur, the new shoulder joint may need to be revised, or re-operated on. After surgery, your medical team will give you several doses of antibiotics to prevent infection, and pain medication to keep you comfortable. Most patients are able to eat solid food and get out of bed the day after surgery. You will most likely be able to go home on the second or third day after surgery. When you leave the hospital, your arm will be in a sling. Your surgeon may instruct you to do gentle range of motion exercises to increase your mobility and endurance. A formal physical therapy program may also be recommended to strengthen your shoulder and improve flexibility. You should be able to eat, dress, and groom yourself within a few weeks after surgery. Your surgeon may ask you to return for office visits and x-rays in order to monitor your shoulder. After rehabilitation, you will most likely be able to lift your arm to just above shoulder height and bend your elbow to reach the top of your head or into a cupboard. Reverse total shoulder replacement provides outstanding pain relief and patient satisfaction is typically very high. Early studies of the results of this surgery have been very promising, but currently no long-term studies exist. This is an area for future research.